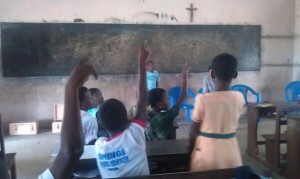 This week saw the launch of the first ever KickStart Ghana summer school, working in partnership with St Cecilia School. KickStart Ghana have provided a grants for four teachers to be employed over the holidays and lunch to be provided for each of the 80 children who will attend daily. Class sizes will be at 20, half of the national average in Ghana during term time. The children attending are all in year 6 and will be moving on to Junior High School next year, the equivalent of a UK secondary school. Working with Ms Alorbi (St Cecilia’s headmistress). the PTA and school management team, these were identified as the children who would benefit most from a summer’s tuition. They will be taught English, Maths, Science and Citizenship by the Ghanaian teachers. These lessons are designed to supplement the Ghanaian curriculum and encourage the children to develop in a holistic manner. At KickStart Ghana we’re incredibly excited by the launch of this school and we look forward to keeping our supporters up to date with its successes. 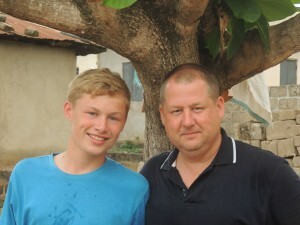 Chris and George Wadsworth, our first father and son volunteering team, recently returned home to the UK. They were coaching Dynamo FC during their time in Ho and we caught up with them to see what they thought of their time in Ghana. This is what they had to say. As an experienced junior football coach, I applied to KickStart Ghana for a number of reasons. I’m passionate about travel and adventure and of course coaching football. The opportunities afforded by KickStart Ghana satisfied all three. Likewise, I genuinely wanted to use my time to support the KickStart Ghana objectives and return to the UK having made a positive impact for the charity and the people of the Volta region. Furthermore, Kickstart Ghana were able to accommodate my request to have my 15 year old son accompany myself; I hoped that the prospect of sharing a lifetime experience with my son, would leave us both with memories to last a lifetime. I wasn’t disappointed. Through my employer Barclays, I realised that there was an opportunity to raise valuable funding for Kickstart Ghana and so this provided further focus for me as a coaching volunteer. Coaching in Ghana would no doubt challenge myself as a coach and as a person and this enthused me further. Q. 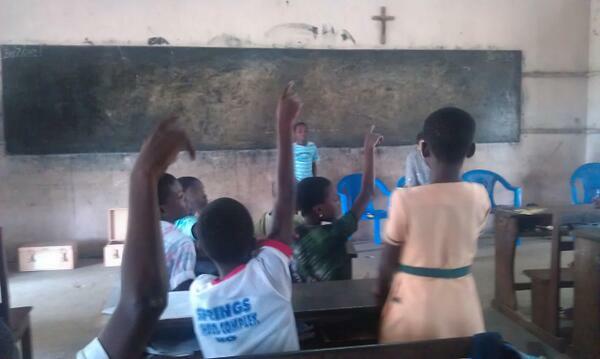 What did you enjoy about volunteering with KickStart Ghana? Before travelling out to Ghana, I completed the induction day with KickStart Ghana, which was well organised, a chance to meet fellow volunteers, but most of all gave me the confidence that I would be well supported (and looked after) during my coaching secondment. With a minor in tow, personal safety was even more of a consideration for me and the guys at KSG provided all the information I needed to arrive in the Volta region with confidence. I particularly enjoyed working with KSG as we not only worked, but socialised on a daily basis with like-minded people and while my son and myself travelled out to Ghana as KSG colleagues, we returned to the UK with strong friendships forged both with KSG volunteers and the fantastic people of Ghana. There were daily challenges to overcome, but through support and the can-do attitude of KSG, these were challenges to be embraced. Nothing was too much trouble for Dave, Dan, Anna, Chris and the team. Likewise, life at the shared house was great – the food was good too. The charity is well-organised and the team are approachable, calm, calculated and passionate about their work; a joy to work with. As previously mentioned, personal health and safety was a consideration and not for one moment while I was in Ghana did I believe that this would be jeopardised at all. Volta region is a beautiful, safe and exciting place to volunteer. Q. What was your favourite thing about living in Ghana? Without doubt, the favourite thing about Ghana was the people. The welcome that myself and my son received was absolutely unbelievable. We felt so “at home” with everyday life and Volta culture. It was fantastic to walk down the street and suddenly hear a local shout out our names, with a warm greeting. I’m not ashamed to say there were tears as we left Volta for the UK, but our promise was to return. At the football coaching itself, we found the players to be courteous, attentive and hard working and ALWAYS played with a smile on their face. The many smiling faces we miss! Whether we coached U10 boys, U18s girls or the senior side, ALL players were keen to learnt and were respectful. P.s. We returned to the UK having learnt the card game of Ghana (SPAR) and have played it every day since!! Q. Would you recommend volunteering with KickStart Ghana to others? If so, what would you say? We’ve created a new role at KickStart Ghana this year, the Assistant Volunteer Coordinator. This is to help manage our volunteers in Ghana; whether that is meeting them from the airport, helping them on their placement or answering any Ghana related questions that they may have! We recruited Chris Minch to do this role early in 2013 and he arrived in Ghana last week. He’ll be with us until the middle of September and he’ll be regularly blogging about living and working in Ghana. Here is his first blog introducing himself. Hi, my name is Chris Minch and I’m working with Kickstart Ghana this summer as the Assistant Volunteer Co-ordinator. I’m writing this blog post mainly to introduce myself and describe what I’m doing in Ghana in the first place, but hopefully there will be slightly more exciting and insightful posts to come as the summer develops. So, firstly, the basics. I’m 22 years old and I’m from Dublin, Ireland. I just graduated from Trinity College, Dublin with a degree in economics and psychology, so come September, I suppose I’ll have to be on the hunt for some sort of job in the big bad world. I have a massive interest in international development and this is something that I will hopefully be able to find work in when I get back to Ireland. Three years ago, I visited Ghana for six weeks. Four of those weeks were spent volunteering in a remote village called Ve Hoeme, about an hour and a half away from Ho. There I was part of a group working on building a sanitation block and teaching in the local school. I spent the other two weeks travelling around Ghana and taking in its many cultural and natural delights. Whether it was sleeping under the stars on the roof of a hostel in Larabanga or chilling in a hammock on Busua beach, I found that Ghana has something to suit everybody’s taste and I instantly fell in love with the country. It was during these six weeks that I got to know a few of the guys working with the organisation Dave Squared Volunteering, now called Kickstart Ghana. At the time, I was just enjoying their company in the moment, along with getting to know all the other people I was volunteering with. However, here I am though, back in Ghana three years later looking forward to a great summer working with Kickstart Ghana in Ho. So a lot more came out of getting to know them then I could have ever hoped for. I’m extremely grateful for the opportunity and excited to get back in to the Ghanaian way of life! Two weeks already? Ghana has a fantastic way of making time go incredibly slow and fast at the same time. When you are waiting for a tro-tro (mini bus) to fill up, knocking back the unwanted offers of meat on a stick, in the mid-day heat and humidity it feels like the seconds are minutes and the minutes are hours. However, it barely feels like any time at all since Dave Thorp and I set down at Kotoka airport at 5am on June 18th. He’s currently in the air heading back to the UK so now seems like a good time to evaluate some of the work we’ve done so far.